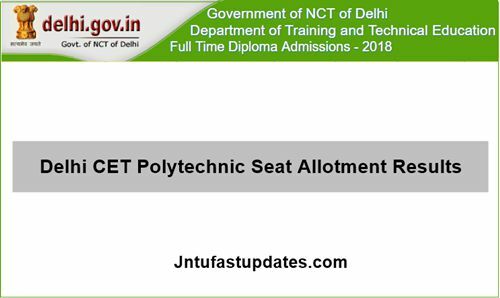 Delhi CET Polytechnic 4th Counselling Seat Allotment Results 2018: The Department of Training and Technical Education, Delhi declared Result of Delhi CET Polytechnic third round counselling and Provisional allotment letter on 25th july on its official website, cetdelhi.nic.in. Students aspiring for the 4th round seat allotment result can check their allotted colleges from the DTTE Delhi official portal. Candidates can go through the article to know more details. The Delhi Department of Training And Technical Education (DTTE) has conducted Delhi Common Entrance Exam (CET 2018) on 26th & 27th May 2018 for students aspiring to get admission into Diploma/Polytechnic/Engineering courses. Candidates those have qualified in the exam can get admission into various Government/Private colleges approved by AICTE. This year a huge number of hopefuls have competed for the Delhi CET examination. The DTTE has organised the exam and also released the Delhi CET results on 14th June. Candidates those have qualified in the test can now check the information of their 3rd allotment result. The DTTE is going to announce the Delhi CET Polytechnic 4th allotment result 2018 today, 25th july at 4 PM on its official portal, cetdelhi.nic.in. Candidates can visit the website to check the 4th allotment list. Candidates, those are not happy with the choices allotted to them can also change, edit, delete their options until-. Students will be allotted seat on the premise of their rank, merit, and available seats. 1. The candidate can see the result of the counselling on the internet at specified date and time as per the counselling schedule, by login using his/her CET Roll no. as login ID and Password (on the Website https://www.cetdelhi.nic.in) as generated by his/her during Online Registration. 2. Successful candidates can proceed for part payment of Institutional Fees as per the procedure mentioned in STEP 5. 3. If the seat is allotted to the candidate, he/she must take out the print out of the Provisional Allotment Letter. 4. The option of printing the Provisional Allotment Letter will be available only for the respective round; within the specified period and the record will not be available in the subsequent round of online counselling. NOTE: – Unsuccessful candidates can participate in the next round of counselling (if any), however such candidates are not required to pay the Processing Fees again. 1. Allocation starts after the registration period is over. 2. A candidate submits his/her choices on registration. 3. The computerized allocation will be done based on the rank, region, category, sub-category, gender, etc. for each of the five tests. 4. The available seats will be allocated according to the preference of choices submitted by the candidate during registration & choice submission. a) Click on the link “Registered Candidate Login” given on home page and fill details. After login, click on ‘Allotment Letter’ link. Click on Print Provisional Allotment Letter, if the seat is allotted. My rank is 7197 can I get admission in any government college. sir my rank is is 14820 from Delhi can I get admission? sir in second cut off maximum rank in electrical engineering is 13346 and my rank is 13113 still i dont get a allotment letter wht should i do? My rank is 8248 can I get admission in any college. Please sir tell me . I clear my 10th class exam from muzzafarpur Bihar.